"CompTIA, the IT industry association and a player in vendor-neutral skills certifications for the global IT workforce, will enable to train as network technicians on smartphones and Tablets through CompTIA CertMaster, an 'intelligent' e-learning platform that uses Artificial Intelligence to adapt to each student in real-time." according to IT Reseller. The new course will enable people to study for the newly-released CompTIA Network+ exam (N10-006) with a learning algorithm that monitors every student's memory capacity, confidence and aptitude and regulates dopamine levels in real-time. The technology could help students learn how to build, manage and troubleshoot networks up to 75% faster than traditional courses. In early trials, the CertMaster platform helped students achieve 80% knowledge retention. The learning platform could help address the global IT skills gap by enabling industry bodies, schools, IT departments, and government agencies to train a new workforce of networking technicians remotely through fast-track e-courses. The new CompTIA CertMaster course maps to new exam content training students in the latest technological innovations, from 'software defined networks' to virtual network segmentation and digital forensics techniques. CompTIA Network+ is the world's leading vendor-neutral certification for networking professionals and demonstrates that an individual has the knowledge and skills to configure, manage and troubleshoot today's networks. Over 400,000 industry professionals are now CompTIA Network+ certified. 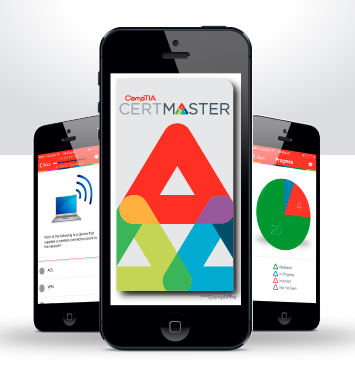 CompTIA CertMaster is an online, confidence-based learning solution that helps individuals learn information faster and retain information more effectively for the long term. The pioneering platform combines key principles of brain science, neurobiology, cognitive psychology and game study to help learners master – not just memorise – the information they need to know.